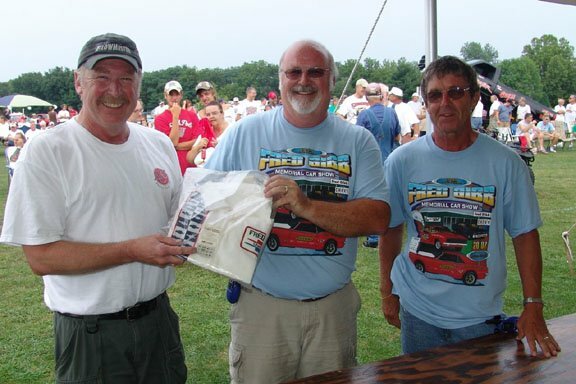 A crowd producing around 400 entries at the Fred Gibb (open) show gathered around the awards tent Saturday afternoon as Fred Gibb's former racer driver, Herb Fox, handed plaques to top winners in 42 different classes. Plaques and trophies were sponsored by area businesses and friends. The best of show trophy was presented to John Peterson of Moline for his bright green 1941 Willeys Coupe. He received this award in 2005 and has also received 200 plus trophies at various events for the same car. Best Mopar: Steve & Bev McQuitty, Macon, Missouri with a 1969 Roadrunner. BEST GM: Rick Stauffer, Washington, Iowa, 1957 Chevy Nomad - black. BEST FORD: Les Baer, Hillsdale, IL, 1970 Boss 429 Ford Mustang. Les has won this award every year, he said. Other winners will appear in an upcoming edition of the Quill. The auction is held annually, courtesy of auctioneer David Hobby to raise funds for the Fred Gibb Memorial Scholarship fund. It is a fun event, and this year's auction was without exception. Jim Parks of Wisconsin out bid Larry Christensen of Colorado for the Fred Gibb jacket that was donated handing over $1150 cash for the scholarship fund. A 2002 Chevrolet Camaro of Clifford Adam of Monmouth stopped sightseers as it was bright red with white racing stripes built as a special edition. Adam has won the Spinner Concourse Gold award at the Chevy Vettefest 2006 McCormick Place, and was a winner of the Route 66 Raceway Chicago/Joliet Super Chevy Show this month. Steve Williams of La Harpe was one of the men looking over the car and recalled his first trip to the Fred Gibb show. "I was in Tornado, Canada driving a semi and I drove all day and all night to get down here for the show. It rained like crazy, he recalled. I knew Fred Gibb and his daughter Connie use to cut my hair," he said. "I delivered papers to their house and I remember Fred driving around town in his diesel Chevy pickup. It was gray and white and he would always wave. They are the nicest people you would ever meet," Steve said. "At first, I thought I would just see a little bit of history. When I was young, I asked my dad why Fred's dealership was all fenced in, then he told me the story about him having all the expensive race cars and parts." Steve said, "In a small town, you think there is not much going on here, then I remember in high school reading the Time Magazine in the early 80s and a story featuring racing cars mentioned Fred Gibb. I remember when the first show was moved to the football field. I like the way it grew and hope it gets bigger." Steve said he was glad people take time out of their busy lives to produce this show. "They say everyone gets their 5 minutes of fame. La Harpe is getting more than their share with Fred Gibb." 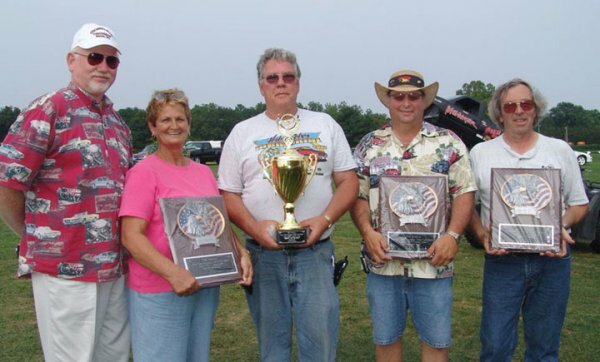 Top winners at the car show are from left: BEST MOPAR- Steve and Bev McQuitty, Macon, MO with their 1969 Roadrunner, BEST OF SHOW- John Peterson of Moline with his bright green 1941 Willys Coupe, BEST GM- Rick Stauffer of Washinton, IA with a 1957 Chevy Nomad (black); and BEST FORD- Les Baer of Hillsdale with his 1970 Boss 429 Ford Mustang. Jim Parks (left) from Wisconsin receives a Fred Gibb coat after he gives Bob Lionberger (center) and Kenny Brown $1150 as top bidder. 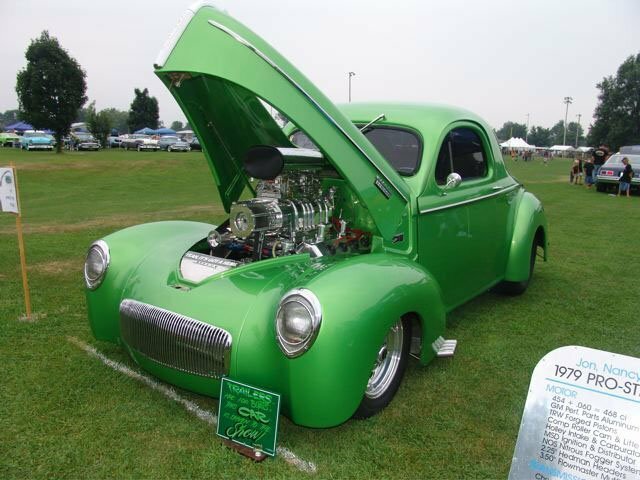 BEST OF SHOW- was this bright green 1941 Willys Coupe owned by John Peterson of Moline. 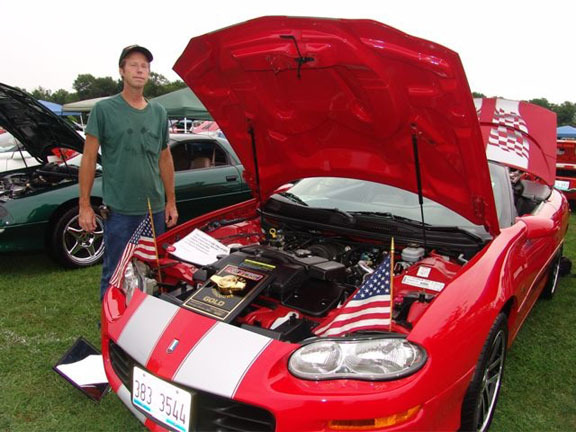 The car has taken over 200 trophies, Peterson said and won Best of Show at the Gibb show in 2005. 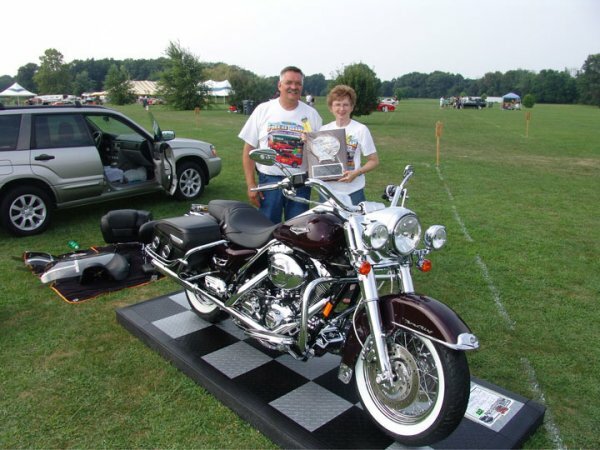 Jim and Jeanette Ford of La Harpe, were presented the Best of Class plaque for their 2006 Harley D Roadking Classic. It was bought new and Jim customized it. It was featued in a 3-page article in the Spring edition of Power Sport News, a motorcycle enthusiast's publication in the Midwest.